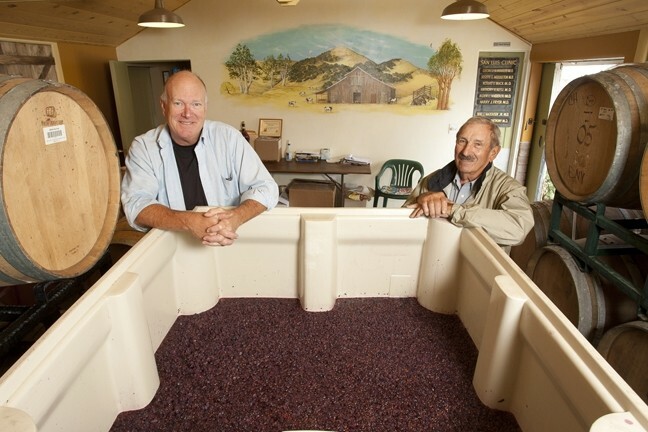 ONCE MILK, NOW WINE: At the old milking barn on the Filipponi Ranch on the outskirts of San Luis Obispo, winemaker Peter Cron and Herb Filipponi showed off a bin of tempranillo grapes that’s about to be pumped into barrels. There’s a lot of heart and soul behind the small family wineries doing business in San Luis Obispo wine country. You’ll find they’re run by people who love what they’re doing, and they strive to improve with every vintage. These passionate people also understand the importance of supporting the community they call home. That’s exactly what you’ll discover at Filipponi Ranch Winery in SLO. The Filipponi family has a long history of doing business in the area, and they chose a winemaker who was equally established in the region. Winemaker Peter Cron, who started making wine for the Filipponi family in 2008, has spent most of his life in the food and wine industry on the Central Coast. I recently sat down to taste through their lineup of fine wines and had an illuminating interview with Cron. I also discovered just how much mutual respect the owners and winemaker have for one another. We tasted through several of his delicious white and red wines currently available, some barrel samples that will soon be released, and new wines recently bottled with their exciting new label, Cronology, a partnership between the Filipponis and Cron. All of their wines are of the quality any connoisseur would certainly appreciate, yet—impressively—the family insists on keeping everything affordably priced. The winery is housed in what used to look like a dilapidated farm alongside Hwy. 101 in southern SLO. Old wooden shutters still cover aging windows, and the rustic-looking bricks are thickly covered from re-painting over the years. It was originally built by Lorenzo Filipponi, a Swiss-Italian immigrant who bought the ranch in SLO in the early 1930s. He established a dairy farm, and part of the property is still used to raise grass-fed cattle. Now it’s owned by his son Herb and Herb’s wife Diane Filipponi, who still manage the 280-acre working ranch. A beautiful mural of a dairy farm pays tribute to Lorenzo and the heritage he provided future generations of his family. When I entered the old building, my nose filled with lovely wafting aromas of ripe grapes fermenting. Still, I couldn’t help noticing it had been retrofitted. Strong steel beams support the walls and roof, and new wood lines the ceiling, making it feel safe. There’s also a cozy, tent-covered patio with spruced-up wine barrels and tables and chairs where you can sit and sip their wines during special events. I was glad to hear the Filipponis’ plan to restore the old, boarded-up house near the winery and make it a tasting room in the near future. Cron pointed out the SLO City hiking trail, which Herb provided the community by giving them the right to pass through his ranch. A ROCKIN’ HARVEST CELEBRATION IN SLO WINE COUNTRY: If you’ve ever wanted to spend the weekend rockin’ and rollin’ while hanging around with the talented winemakers in SLO Wine Country, here’s your chance: Sign on for the “Friday rockin’ road trip” where you’ll get a backstage pass to learn the art of winemaking through hands-on experience, and enjoy lunch and wine tasting with the winemakers. Or participate in “crafted on the coast,” a collaborative winemakers’ dinner at the Casita Estate in rural Arroyo Grande. This annual celebration has attracted wine connoisseurs from afar and plenty of locals for nearly three decades. This year’s Rockin’ Harvest Celebration runs Friday through Sunday, Nov. 1 through 3, with an array of attractions affordable for most budgets. Admission to events can be bought separately, and entry to the grand tasting and auction is only $85 per person including food, wine, and entertainment from noon to 3 p.m. Pay $95 and get in at 11 a.m. to beat the crowd. You’ll find the who’s who list of participating restaurants and wineries, one-of-a-kind lifestyle auction lots, and Sunday open house events by visiting slowine.com, where you can buy tickets. I’ve visited Filipponi Ranch many times over the past decade or longer: as a judge at the SLO winemakers’ cook-off several years; to visit Per Bacco winery, which has since moved on; to cover Clesi and their amazing Italian and French style varieties; and finally to visit Filipponi Ranch winery to interview Cron. That’s when he introduced me to his very impressive new Iberian varieties, verdelho and tempranillo, for a new label that will enter the markets this winter: Cronology. “Every year I get more about why I’m doing this. I don’t want to use the cliché ‘It all happens in the vineyard,’ but it’s true, we’re only steering,” explained Cron, who previously owned and made wines for Laverne Cellars in SLO for eight years in partnership with his family. But he prefers his winemaking role at Filipponi Ranch, where he can focus entirely on his craft. Cron buys grapes from several family-owned vineyards managed by small growers (some of whom he consults for) that provide varieties for both brands made here. During the Rockin’ Harvest Celebration, do check out their rock solid lineup of delicious wines and the great people behind the brands of Filipponi Ranch Cellars and Cronology. They created the perfect formula in their niche and make wines that attract wine lovers who seek an array of good quality varieties and blends at fair prices. And you couldn’t ask for a more friendly wine tasting experience.